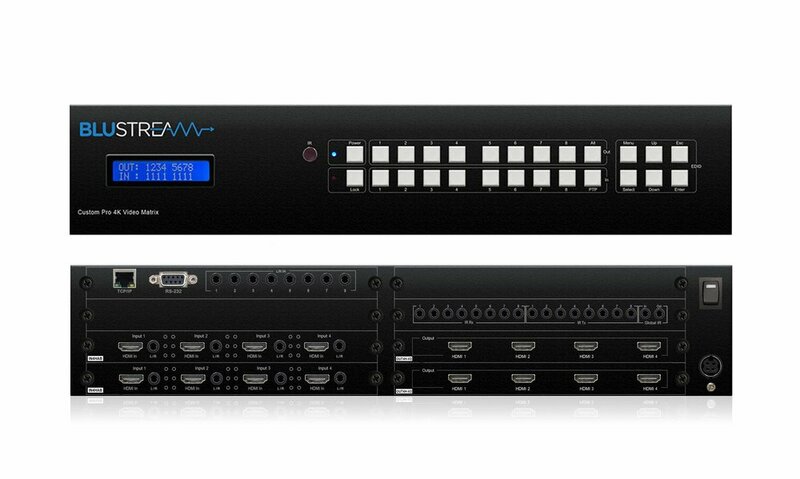 With a Custom Pro Matrix you can choose the configuration that best suits your client; we have also prepared some pre-configured alternatives that boast audio breakout, simultaneous HDBaseT/HDMI outputs, RS-232 pass through and a web browser interface module for enhanced control. The New Custom Pro solution is the perfect choice for installations that aspire to deliver the very latest 4K HDR resolutions. 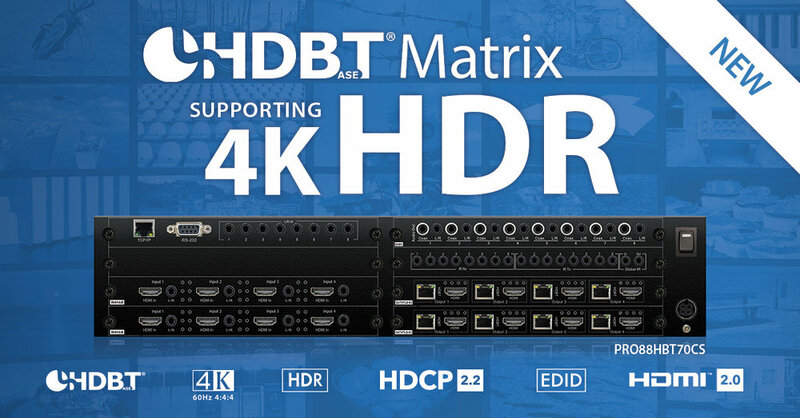 Our Custom Pro 4x8 HDBaseT™ CSC Matrix offers unprecedented 4K HDR performance for the custom installation market. The PRO48HBT70CS is a HDMI2.0 4K 60Hz 4:4:4 HDCP2.2 Matrix utilising CSC technology to deliver HDMI, Bi-directional IR, PoH (PoE) up to lengths of 70m over a single CAT cable (4K with HDR up to 40m). The Matrix also provides advanced features including audio breakout and a web browser interface module for control and configuration of the matrix. The Matrix also provides advanced features including 8 x simultaneous HDMI outputs, audio breakout with line level pre amp volume control and a web browser interface module for control and configuration of the matrix. Our 100m Custom Pro 8x8 HDBaseT™ CSC Matrix offers unprecedented 4K HDR performance for the custom installation market. The PRO88HBT100CS is a HDMI2.0 4K 60Hz 4:4:4 HDCP2.2 Matrix utilising CSC technology to deliver HDMI, Bi-directional IR, PoH (PoE) up to lengths of 100m over a single CAT cable (4K HDR up to 70m).The Matrix also provides advanced features including 4 x simultaneous HDMI outputs, audio breakout with line level pre amp volume control and a web browser interface module for control and configuration of the matrix. Our Custom Pro HDMI / VGA 8x8 HDBaseT™ CSC Matrix offers unprecidented 4K HDR performance for the custom installation market. The PRO4V4H8HBT70 is a HDMI2.0 4K 60Hz 4:4:4 HDCP2.2 Matrix utilising CSC technology to deliver 2 x HDMI 2 x VGA, Bi-directional IR and PoH (PoE) up to lengths of 100m over a single CAT cable (4K HDR up to 70m). The Matrix also provides advanced features including 4 x simultanious HDMI outputs, audio breakout with line level pre amp volume control and a web browser interface module for control and configuration of the matrix.